Pages Creek Estate is the venue for where your lifetime adventure begins. Let us host your special day, and provide you and your guests with an experience to be cherished. We offer a unique venue for you to bring your own distinctive ideas and flair – your marquee, your caterers, yours to arrange as you wish. 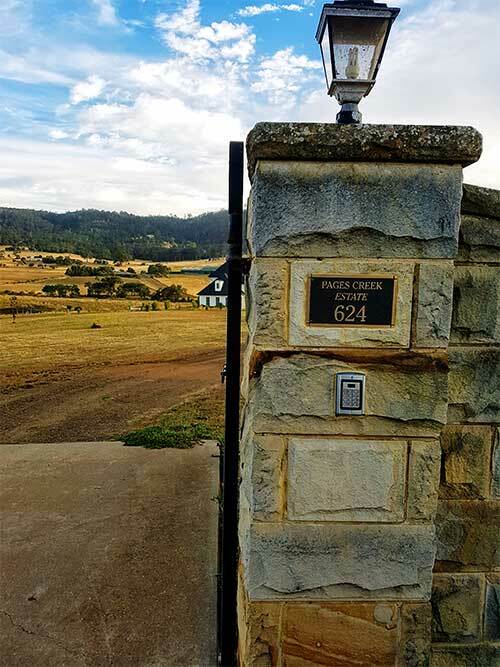 Pages Creek is a 12 acre vineyard established in 1999 by Peter Lowrie in undulating countryside in the Coal River Valley near Hobart, Tasmania. The property offers a magnificent venue for your special event. Imagine the romance of your special day surrounded by the elegance that is Pages Creek Estate … the tranquillity of the vineyard, the beauty of our scenery, a special place for you to create your lifelong memories. Situated five minutes from Historic Richmond, Pages Creek Estate is in the heart of the Coal River Wine Region. The area boasts multiple vineyards, tourist destinations and even a Zoo! With plenty of room for guests and a dedicated space to erect a large marquee, we boast loads of car parking and unlimited access for coaches. At Pages Creek Estate we aim to please. A leisurely thirty minutes scenic drive from Hobart – Pages Creek Estate is situated on Middle Teatree Rd nearby to Richmond or Brighton. Using your own caterers and freedom to decorate as you wish, a memorable day is assured. Naturally we can suggest multiple vendors that would love to be involved. If whisky is your thing we have you covered! With a great range and good prices, we can set up a tasting for beginners to the connoisseur.